Scotland on Sunday, a Sunday newspaper published nationwide in Scotland, published an article on July 13th encouraging Scots to experience the "re-wilding" of the Great Plains on holiday. The article specifically cites efforts across the Plains to reintroduce natural flora and fauna and the declining human population over the last decade. 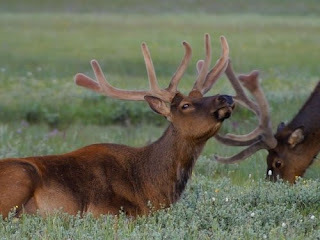 As animals like elk, bison, bighorn sheep, and wolves are repopulating in the Great Plains, several ecotourism groups offer a chance to glimpse these unique animals--guided tours, animal and bird watching trips, etc. Visitors can even experience life and work on a North Dakota ranch! Several eco-tourism groups are also encouraging self-guided tours across the plains via car. Tell us what you think! How do you feel about encouraged tourism in our area? Will it help or hinder efforts to preserve the natural world of the Great Plains? I'd like to be the first to comment on this article! While I undoubtedly encourage tourism in the Great Plains (nothing will help people appreciate this area more than seeing it first-hand), I am a little skeptical about encouraging driving tours. On one hand, driving across the entirety of the plains will add to pollution problems, but on the other, is there really a logical alternative? There isn't public transportation across the midwest! I guess I'm not sure how I feel about it...I wish there were an alternative.